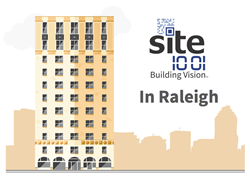 Site 1001 is looking forward to helping Raleigh not only become a smart city, but a model for other smart cities as well. Analysts estimate nearly half of all energy and water consumption, waste products and carbon emissions within a city comes from its buildings. Site 1001’s technology is designed to provide building managers highly detailed operational and maintenance information about all of their building’s components — from major heating and cooling systems down to minor plumbing fixtures like drinking fountains and faucets — so they can they can troubleshoot problems quickly, reduce waste and improve a building’s efficiency from top to bottom. Site 1001 is also partnering with regional networks of academics and businesses working to accelerate the area’s economy including NC RIoT, HQ Raleigh, and the Research Triangle Cleantech Cluster. Site 1001 plans to have its innovation center and interactive demonstrations of its smart building technologies available to the public in October of 2017. To schedule a visit at the new Raleigh office, please contact Site 1001. To see a full schedule of Site 1001 events, please contact Site 1001 via email info(at)site1001(dot)com, phone (949) 276-6300, or visit https://site1001.com/company/shows-events/. The company is based in Kansas City, Missouri, has sales offices in Southern California, and Raleigh, North Carolina, and operates a research and development lab in Bend, Oregon. For more information, visit http://www.site1001.com on the web, email info(at)site1001(dot)com, or call +1 (949) 276-6300.